So, we have finally finished our entry, a few hours before the deadline! The competition is about building an eco friendly or renewable based circuit that uses a ChipKIT board, and is run by designspark, Elektor and Circuit Cellar. We built a maximum power tracking circuit, which performs impedance matching to transfer power out of a source efficiently. Basically all energy sources have some resistance as part of their construction (like the internal resistance), and we make sure that our circuit presents a load to the battery which wastes the least power. Our one is a bit different from the current designs on the market, or indeed, in the research, as we used a discontinuous mode boost converter to give really good control over the circuit, and to use only voltage sensors. These are much cheaper and simpler than the current sensors used in some of the competing designs, and brings the circuit cost right down, to around £50 for our prototype. One application in particular that would benefit with the addition of this MPPT is the new TEG being developed by BMW in conjunction with NASA which improves fuel efficiency and reduces CO2 emissions by up to 5% and is aiming to eventually replace the need for an alternator as it aims to produce enough electric power to run all the electrical components of the car. The energy and environmental implications of this will be huge, when taking into consideration that if successful, it could be applied to all vehicles (cars, lorries, etc) around the world, which is a massive reduction in oil consumption, and big improvement in energy efficiency as it re-uses the heat escaping from the exhaust in order to provide power to the vehicle. Considering that around 60% of the energy generated by a typical internal combustion engine is lost, half by heat absorbed by the engine cooling system, and the other half lost via exhaust heat, thus by reusing this exhaust heat the efficiency of the engine can be significantly improved. So, the design. 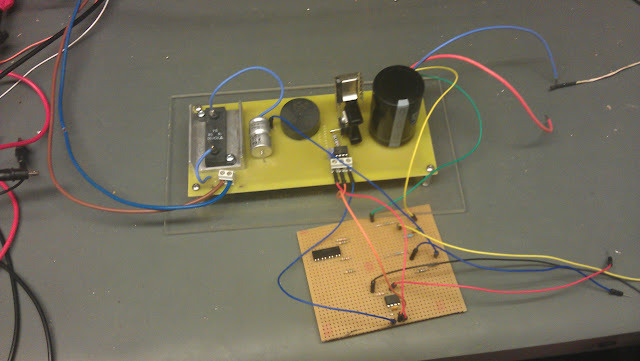 We started off with constructing a generic boost converter in LTSpice, using ideal components like switches instead of FETs. This keeps it simple for the time being, and allows the filter values and switching times to be selected. Now this circuit has to allow for both changing voltages and changing loads to be useful in the real world. 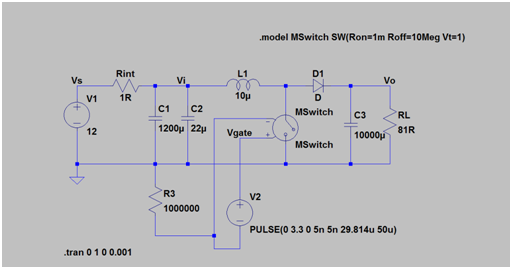 To do this, we need to sense the input and output voltage, and change how the switch operates accordingly. 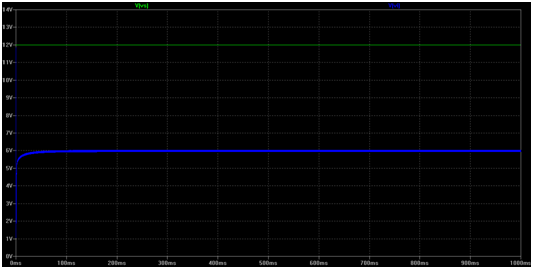 We used a ChipKIT to measure these voltages after having scaled them down with potential dividers. This allows for closed loop control, using a really simple bit of code that put the inputs into a 2D matrix, and returned the pre-calculated duty cycle to be fed to the switch! Really quick as well, which means we can respond to fast changing loads as well. With the circuit looking like it’s working, we then designed a PCB for the main Boost circuit using DesignSpark PCB, a pretty good bit of free software for doing PCB design and schematic entry. 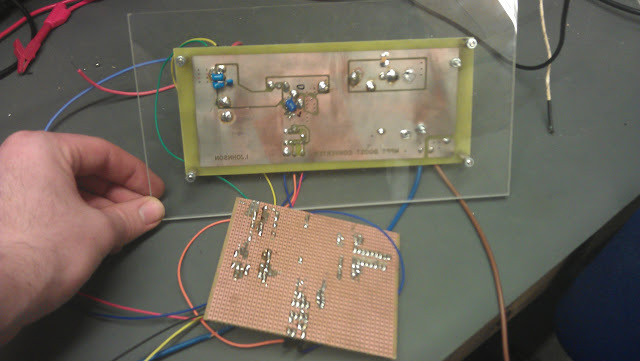 It was the first time we used this, but the PCB turned out pretty well. We also needed another PCB for the control and interface circuitry, but we decided to prototype this on breadboard before we committed to a PCB. 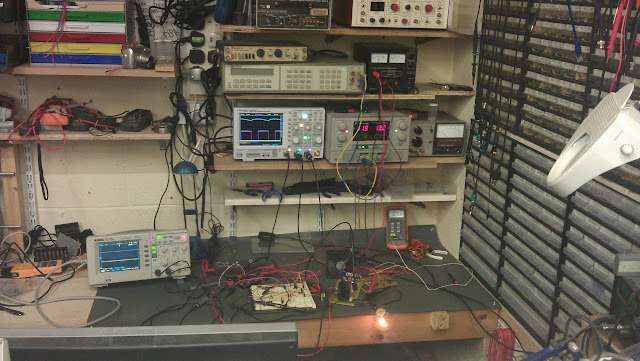 Actually measuring the performance of the circuit is always something of a challenge for these kind of circuits. Fortunately, we have the Hameg 4ch scope for most of the measurements, with a Rigol scope when we got short of channels. 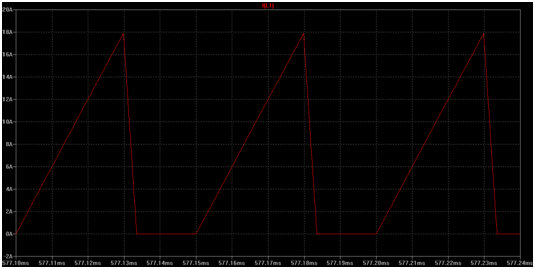 We also had a differential probe for measuring the floating voltages, and a couple of current probes. Add to that a high current power supply for the input to the circuit, a second power supply for the chipkit and a third power supply for the interface circuitry. And a few multimeters, and temperature probe for monitoring the heatsinks, and a laptop for debugging the code. The bench started to get pretty full! We’ll get the full results up in our report, but the circuit works as efficiently as competing solutions, but without using expensive current sensors. It also works in the discontinuous mode, which offers very good control of the output and a very suitable source for voltage stabilisation, ready for laptops, lighting etc. We filmed this just after we got the circuit working, so a bit of a rough one this time. We are doing the filming for a proper one to follow, and we’ll get a report uploaded in a week or so!